Just kicking-off this blog with a single image that does a lot to encapsulate the work that I do. The following image incorporates 3 key elements to my research, which is concerned with how expectation and attention can 'tune' our visual awareness. 1) Seeing things that aren't there: There are actually no triangles of presented in this image, rather there are a series of V and 'pac-men' shapes. Through a process known as amodal perception, our minds actually interpret the images as two overlapping triangles. We actually 'see' the edges of the downward pointing white triangle, and we perceive the pacmen shapes as being occluded discs. (This demonstration of amodal perception was originally developed by the psychologist Gaetano Kanizsa, and was first presented in 1955). 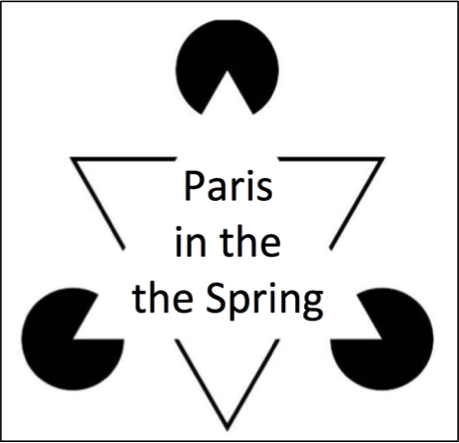 2) Failing to see things that are there: Did you read the text inside the triangle as 'Paris in the Spring'? Check again. That's not what it says. It actually reads 'Paris in the the Spring.' This illusion appears in many introduction to psychology text books, but I've never actually seen an attribution. The effect is analogous to a phenomenon known as inattentional blindness. Where people fail to see objects are events that are plainly visible when their attention is otherwise engaged. 3) Counter-intution: Was it surprising to realize that there really wasn't a triangle, or there was really an extra 'the'? One of the most interesting things about illusions is that they can strongly violate people's innate beliefs about there own perceptual systems. People generally believe that their conscious visual experience is good indication of an objective reality, but in fact much of our visual experience is arguably constructed from illusions.